The Ensemble of the Novodevichy Convent is a monastic complex and the best-preserved representative example of "Moscow Baroque". It had a symbolic and physical relationship with the Moscow Kremlin, the "Tsar's road" linking the two complexes. Novodevichy means "New Nunnery". It was here, in the 16th and 17th centuries, that women from the royal family and top-ranking families took the veil. The complex consists of 15 buildings, surmounted by golden domes. The complex is surrounded by a wall. 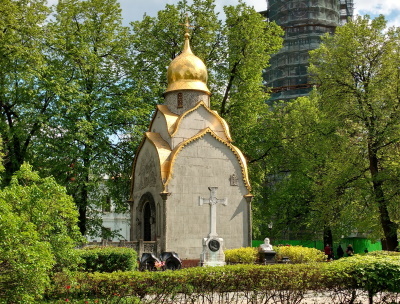 The Smolensky Cathedral is the main monument on site. The big picture above looks very familiar to me, because it has decorated the wall in my living room for years. It was given to me by my parents, to commemorate my visit to Russia in 1990. 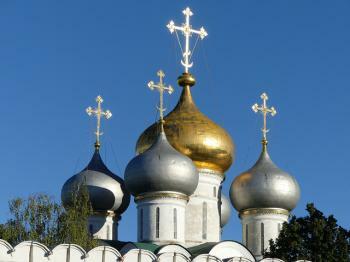 The Novodevichy Convent is one of the most remarkable places in and around Moscow. Unfortunately I only did a quick tour, as I was with a group. Also, I was a very unexperienced traveller at that time (I was only 20 years old). Taking pictures and writing a diary was not on my agenda then. 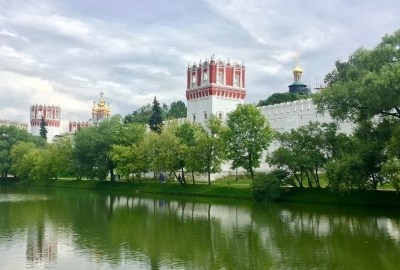 Located in the south-west region of Moscow, not too far from the banks of the Moskva river, Novodevichy convent does not give an impression of a religious complex at first glance. Tall, thick convent walls, crowned with twelve towers appear impenetrable and would not be out of place in a fortress protecting the approaches to the capital. The walls encase several monumental structures: the Smolensky Cathedral, several churches and the six-tiered belltower, once the tallest building outside of Kremlin. It is perhaps not a coincidence that the construction of the convent commenced in 1524, around the time that the Great Prince Vasili III was doing his best impression of King Henry VIII by trying to end his marriage with the childless wife of 20 years. It was suspected that the newly-built convent was going to become the new home of the Great Princess. While she had never made it to the convent, it did become the designated place for the confinement of the female members of the royal family. Famously, Novodechy Convent was the place where Peter the Great incarcerated his older sister Sophia during the struggle for the throne. Before my visit, I had not realized that the main attractions of the convent - the cathedral and belltower - were covered in scaffolding. They have been undergoing restoration until a fire accident in 2015. This has set the progress further back, and the date for the completion is unknown. Still, the view of the convent from the lake and the rococo architecture inside are worth the free entry. Although beware, the free entry is only mentioned in Russian, where is in English it mentions a fee. I visited this WHS in August 2016. After the Kremlin and St Basil's it is perhaps the most visited site in Moscow. I visited on 3 separate occasions but entered the site proper only once. My first visit was at night time to take photos from the nearby duck pond. The view was pleasant enough with the white walls reflecting on the duck pond. Getting there at night time from the metro station Sportivnaya wasn't that straightforward and quite spooky and dark at times. The main highlight were the white walls surrounding the convent but I wasn't impressed by the ensemble. The octagonal bell tower is still covered in scaffolding due to the recent fire and the old burnt down scaffolding is still inside the convent property. The walls and main buildings are painted frequently and the whitewash sacks and paint can be seen towards the rear part of the convent close to the cemetery. This meant that when I visited the convent interior, parts of the site looked more like a permanent construction site than a WHS. It is still worth visiting the interior to have a better understanding of the site but I wasn't too impressed by the OUV if indeed there is any. The main highlight of the convent's interior apart from the Cathedral of Our Lady of Smolensk (picture) was the very small burial vault or Prokhorov Chapel with golden mosaics. The obvious highlight of the convent's exterior is the Gate-Church of the Transfiguration. 2 UNESCO inscription plaques can be found by the entrance, one in English and one in Russian. All in all it was a pleasant half day trip to an interesting cloister and cemetery but in my opinion it is the least interesting of the WHS in Moscow. 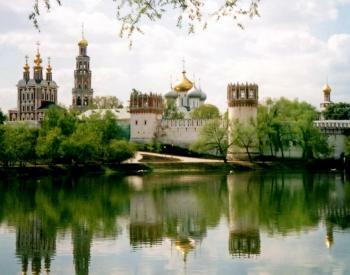 The grounds of Novodevichy Convent are so serene you can almost forget you are in the middle of Russia's largest city. The convent was built by the Grand Prince of Moscow in the 16th century in commemoration of his successful campaign winning Smolensk from Lithuania. Accordingly, the main cathedral in the complex, Smolensky Cathedral, is dedicated to Our Lady of Smolensk, an icon of Mary housed in the Assumption Cathedral in Smolensk (and possibly destroyed in the Second World War). Near the cathedral is a visually arresting, six-tiered, red and white belltower built during the 17th century in the same Muscovite Baroque style that can be seen throughout the convent. I'm happy to hear the belltower escaped serious damage when scaffolding caught on fire during repair work in 2015. The entire convent complex was beautiful to observe, and I wish I had had more time to explore, but, like some of the other reviewers, I was with a tour group and thus on a schedule when I visited over a decade ago. If in Moscow, this site is most definitely worth a visit. Logistics: Novodevichy Convent can be reached by automobile or by Metro (via the Sportivnaya station). I visited Novodevichy in the middle of August 2015. Inside the complex, majority of the buildings are being restored at the time, including the tower that caught fire in March 2015. To make up for my "bad luck," I visited the cemetery instead, where famous writers, academics, soldiers are buried. It was a delight visiting Anton Chekhov's grave (pictured here). Novodevichy is without doubt one of the most beautiful places I've visited. From a distance and from close up it offers all sorts of charming discoveries - especially if you like taking photos. I first saw it on a city tour, but a five minute stop was sufficient to make me determined to return to see it properly, which I did two years later - it was worth it. It's said that when Napoleon tried to blow up the fortified walls on his way into Moscow the nuns ran out and extinguished the fuses with their bare hands. Tolstoy sets a scene from War and Peace on the lake in front of the convent which freezes in winter and is a popular place to skate. Indeed Tolstoy himself skated there, his Mosocow house still stands nearby and of course is also well worth a visit. I lived in Moscow as a graduate student at MGIMO not far from the Novodevichy Convent in 1991, and this beautiful haven was a constant source of peace for me in a year of turmoil. I loved to walk through the gardens and visit the chapels, particularly in the spring and summer, although I also loved its quietude during the snowy winter months. I returned on subsequent business trips with others, and my first place to take newcomers to Moscow was to see Novodevichy. A visit to U Pirosmani restaurant, just up the street, would follow for some delicious Georgian food. Now I am a Roman Catholic religious sister in the US, and I hope that someday I'll be blessed to again visit Moscow - after visiting the Cathedral of the Immaculate Conception and Saint Louis, where I attended Mass when I lived in Moscow, I will go to Novodevichy and again walk its peaceful paths, this time myself as a women consecrated to God through the vows of chastity, poverty and obedience. I lived in the city for a summer and this convent was my favorite part of Moscow, if not all of Russia. If you have time it should not be missed. I went back twice in one weekend. If you like a break from big city madness you can't get anything close to this peaceful in most parts of the city. Just as a tip for women, you should remember that you cannot (or simply should not) enter some of the areas used for services without a scarf or shawl to cover your head. Follow the lead of the women around you. Most Russian women wore their scarves around their necks until it was time to enter the buildings. Also the lake is worth walking around on nice days and, if I remember correctly, there is a playground on the other side if you have children. One last tip is that you do need to pay to take pictures of the buildings. Using your cameras inside is not allowed, but you may be able to take a few shots in areas that are exhibits and not used for religious purposes. This site is definitely worth an afternoon, to see each of these most beautiful, dainty buildings up close without the crowd you encounter at the Kremlin. Also worthwhile is a quick trip to the cemetary of the Russian notables to reflect a little on their lives. The little lake that Tchaikovsky is supposedly to have written Swan Lake by is now only occupied by ducks, but approaching from the main road, the lake provides nice foreground for the convnent ensemble. Novodevichy Convent is a real treasure of Moscow apart from the famous Kremlin and Red Square, with the interesting historical link with Russian imperial family in every perspectives; served as their royal chapel or even their prison, Russia government wanted to inscribe this place as an extension of Kremlin, but finally it has become the third WHS in Moscow. Originally designed as a part of Moscow fortification system, this fortress convent is fortified by red high brick wall for defensive purpose. As the convent was supported by the monarchs, it was constructed by the best artisans making this convent to be one of the most beautiful religious complexes in the whole Russia. In my opinion the most significant building in this complex and worth to see is the main gate which built in a style called Naryshkin Baroque (Moscow Baroque), a quite unique and more elaborate of Russian Architecture which borrows some elements from central Europe. Five baroque golden domes, which look like they come from Bavaria or Austria, are very good anecdote from typical Russian onion style. 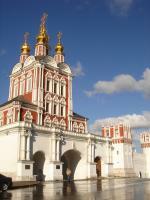 The convent is located near central Moscow and on the short distance from the Sportivnaya metro station on the red line. Beware! This convent is on the list of the must see in Moscow so prepare for a lot of tourists or be there in early morning to soak the unexplainable peaceful atmosphere inside the complex. After the convent, do not forget the cemetery, Novodevichy Cemetery is the no.1 burial place for Russian, so you can see the tombs of many famous people, the latest one is Boris Yeltsin who died two weeks before my visit. Undergoing Restoration or Repair: A well-documented fire broke out during restoration of the convent's bell tower in 2015. Because of the fire, repairs are now expected to be completed in 2019.